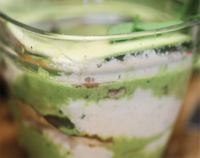 Prepare the ricotta cheese by mixing all ingredients into Vitamix or food processor and process until smooth. Set aside in a bowl, scrapping the sides to get all the ‘cheese’. Rinse Vitamix and blend all the pesto ingredients together, slowly adding the oil while blending. Set aside in a bowl, scrapping the sides of Vitamix to get all pesto. 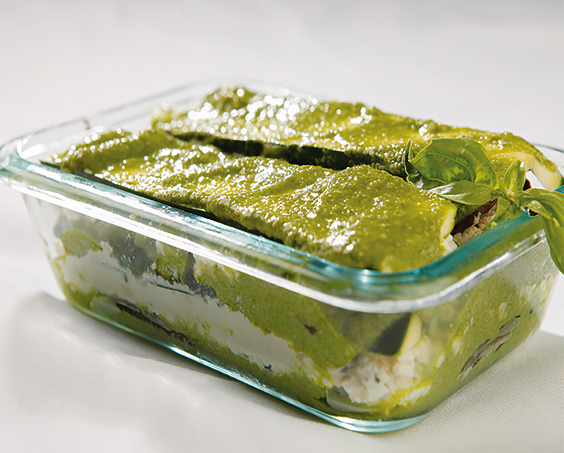 In a 3 x 8 baking dish, smear a small amount of pesto on the bottom. Layer 2-3 pieces of zucchini. Layer 1⁄2 the amount of ‘ricotta’ on top of the zucchini. Layer 2-3 portabella mushrooms on top of the ricotta. Layer 1⁄2 the amount of Pesto on top of the mushrooms. Repeat once more and end with pesto layer on top. Garnish with leftover pine nuts and shredded basil. Bon Appetit!